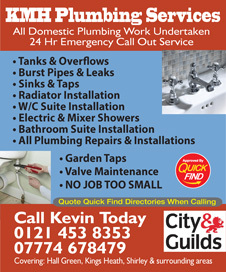 Approved and recommended by Quick Find Directories, KMH Plumbing Services are a local trusted plumber in Shirley, Solihull, Birmingham and surrounding areas. 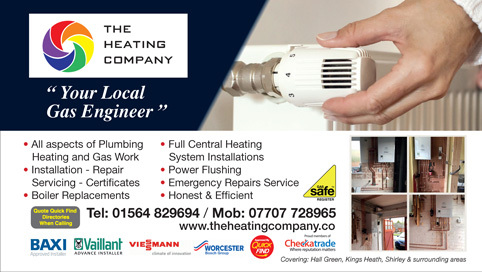 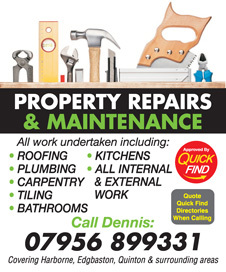 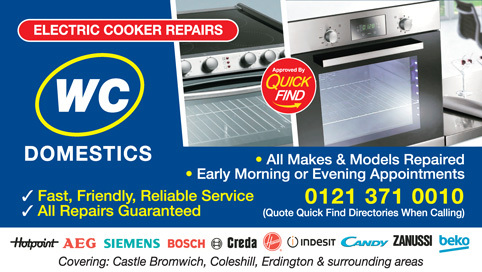 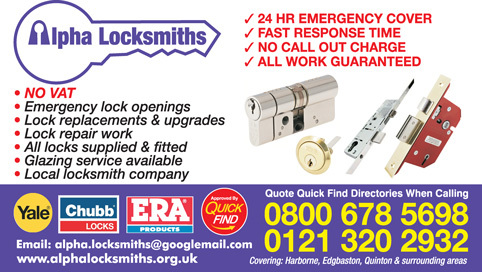 Approved and recommended by Quick Find Directories, Rockfast Emergency Plumbing and Heating are a local trusted trader in Shirley, Hall Green, Birmingham and surrounding areas. 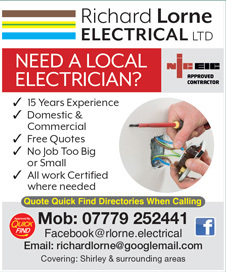 Approved and recommended by Quick Find Directories, Richard Lorne Electrical Ltd are a local trusted electrician in Shirley, Hall Green and surrounding areas. 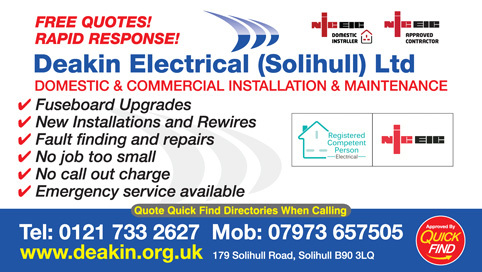 LH Electrical Services Midlands Ltd are a Quick find Directories vetted and recommended, NAPIT registered local electrician in Solihull, Rubery, Rednal, Wythall, Shirley and surrounding areas. 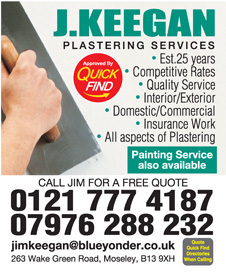 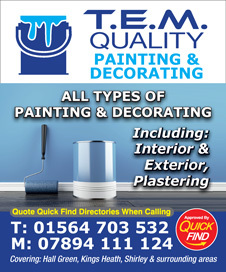 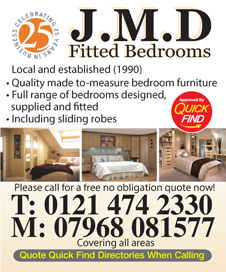 Approved and recommended by Quick Find Directories, T.E.M Quality Painting and Decorating are a local trusted trader in Shirley, Birmingham and surrounding areas. 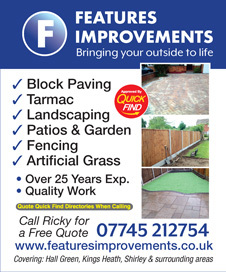 Approved and recommended by Quick Find Directories, Marlea Driveways and Paving are a local trusted trader in Shirley, Hall Green, Birmingham and surrounding areas. 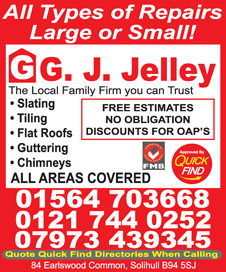 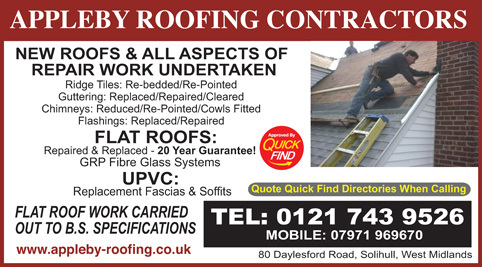 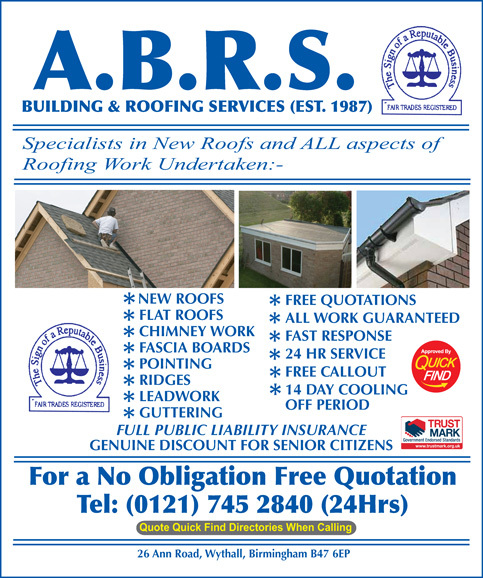 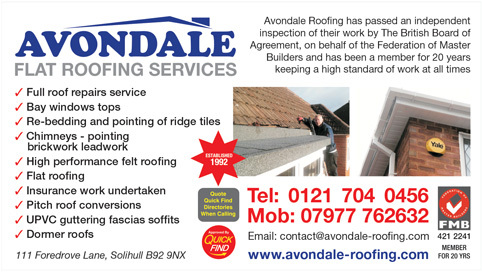 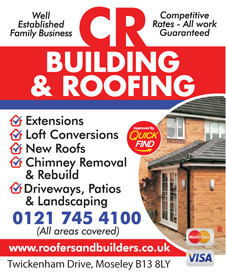 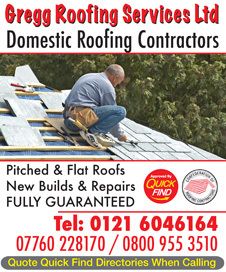 Approved and recommended by Quick Find Directories, GJ Jelley Roofing are a local trusted roofer in Sutton Coldfield, Shirley and Olton. 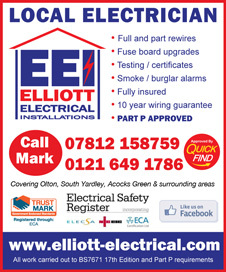 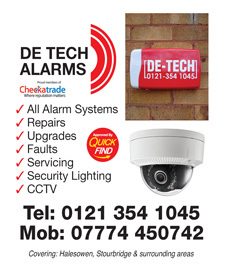 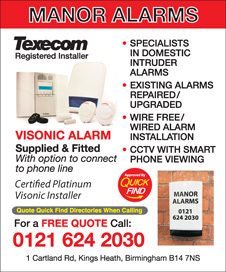 Approved and recommended by Quick Find Directories, Yeomans Electricals Ltd are a local trusted electrician in Shirley, Hall Green and surrounding areas. 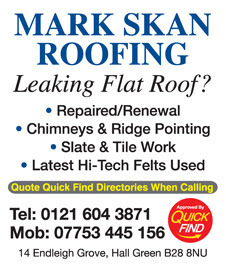 Approved and recommended by Quick Find Directories, Mark Skan Roofing are a local trusted trader in Shirley, Hall Green, Wythall, Kings Heath and surrounding areas. 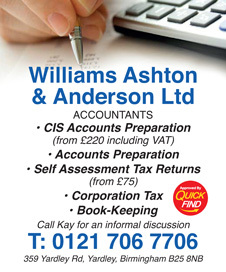 Approved and recommended by Quick Find Directories, Williams Ashton & Anderson Ltd specialise in accountancy and bookkeeping. 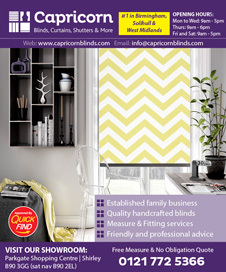 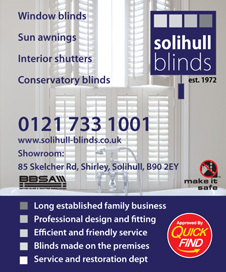 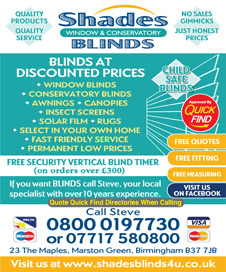 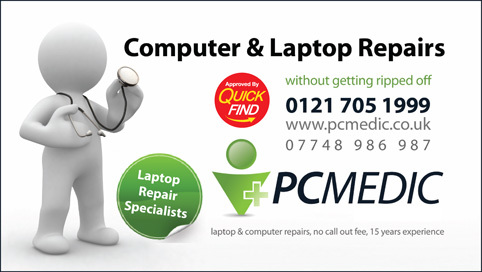 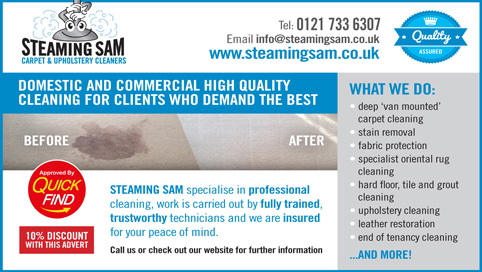 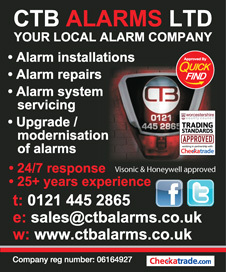 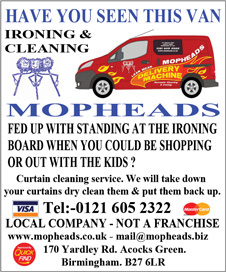 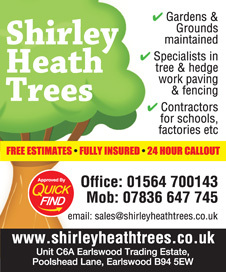 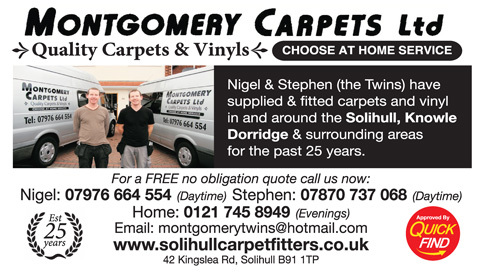 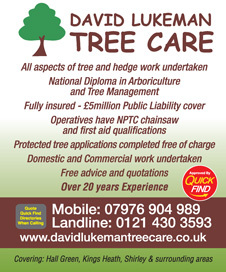 Local trusted accountants in Solihull, Birmingham. 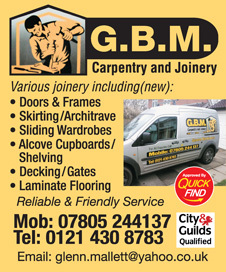 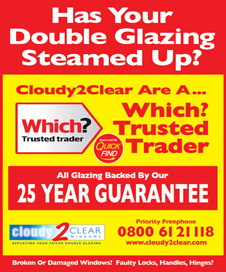 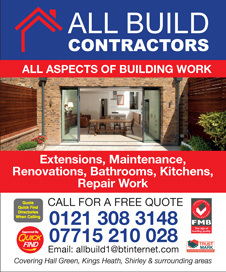 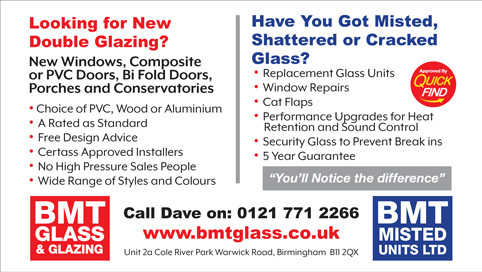 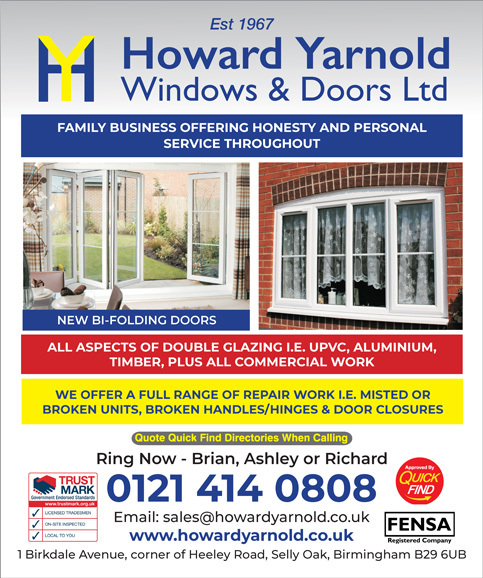 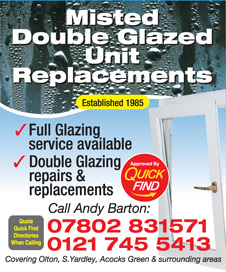 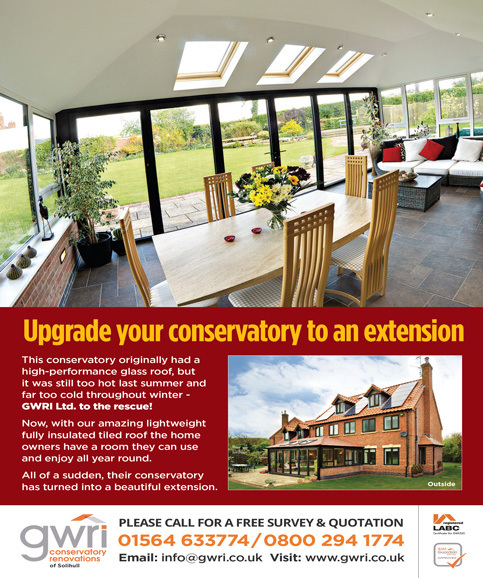 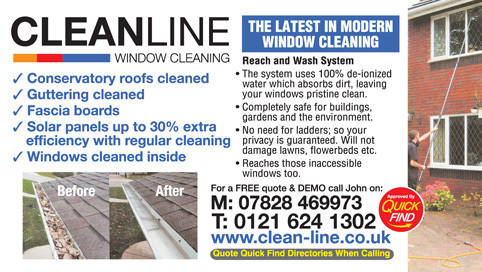 BMT Glass & Glazing are a Quick Find Directories vetted and approved local business specialising in replacement double glazed units in Shirley, Hall Green, Olton, Solihull and surrounding areas. 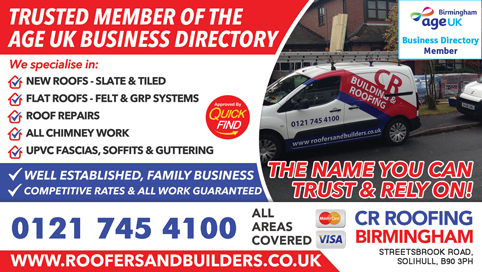 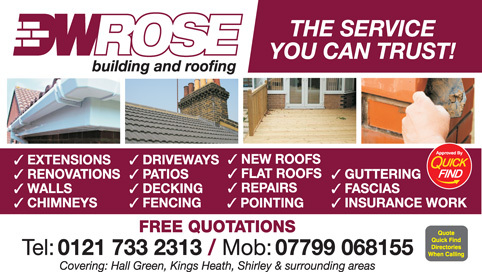 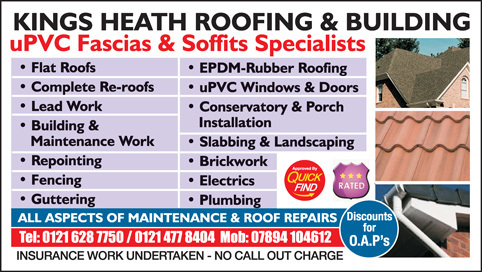 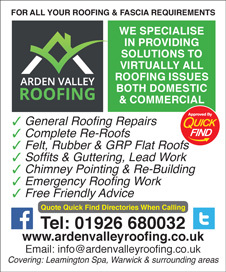 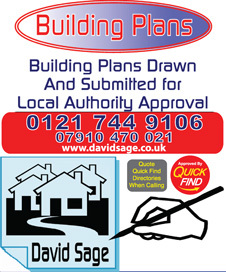 Approved and recommended by Quick Find Directories, Gregg Roofing Services area local trusted roofer in Shirley, Wythall, Hall Green and surrounding areas. 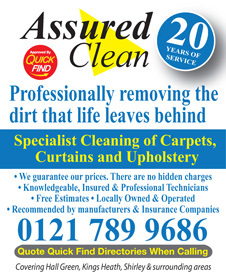 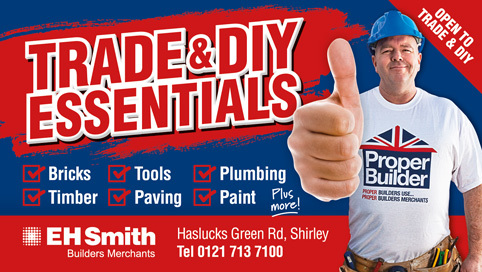 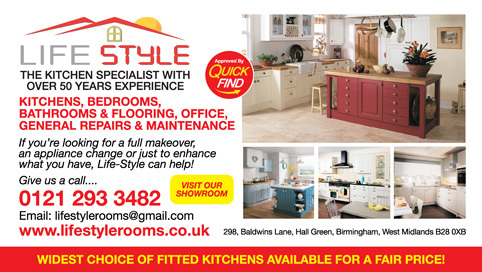 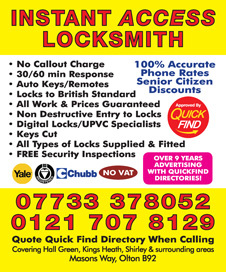 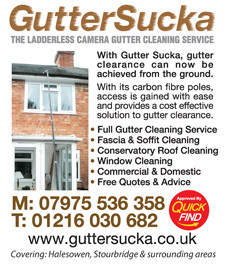 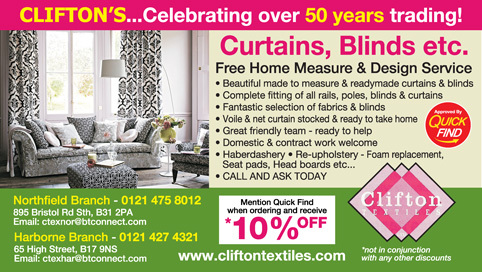 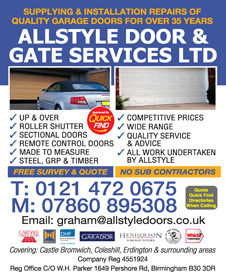 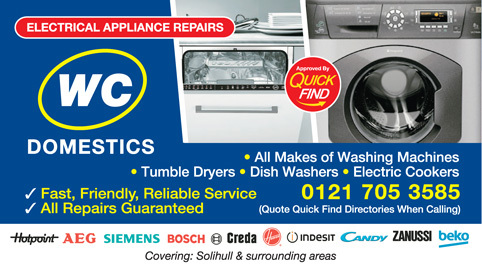 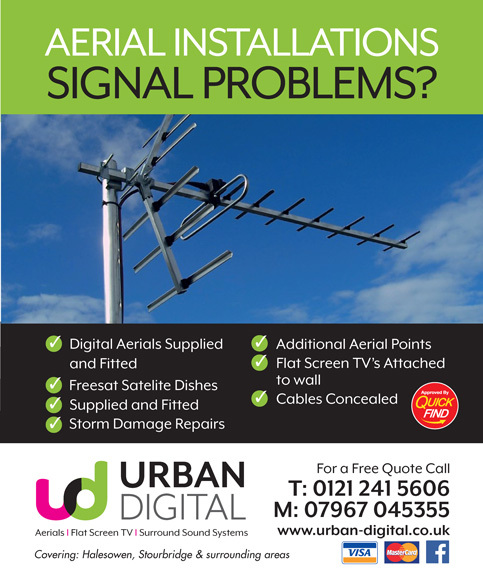 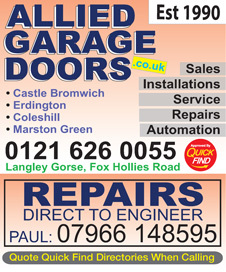 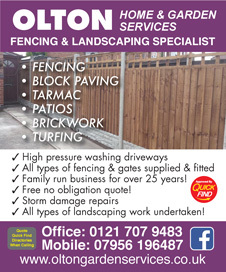 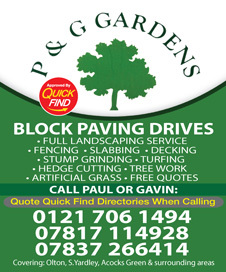 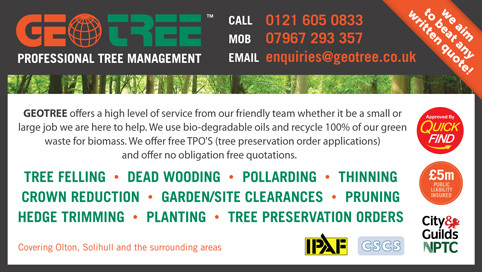 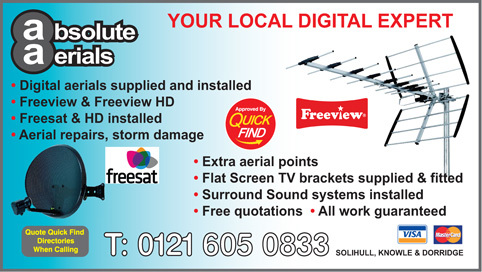 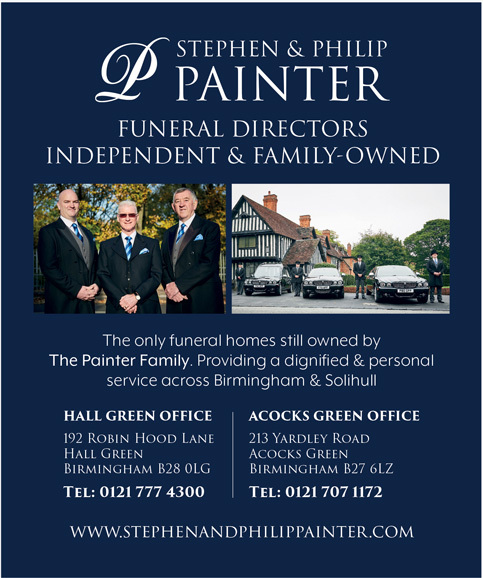 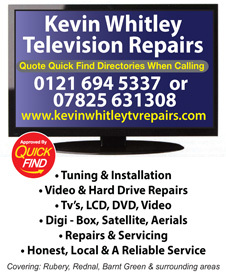 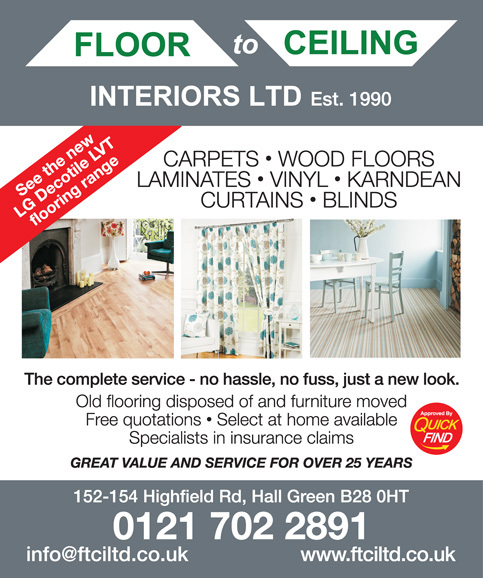 Approved and recommended by Quick Find Directories, P&G Gardens are a local trusted trader in Solihull, Shirley, Olton, Birmingham and surrounding areas. 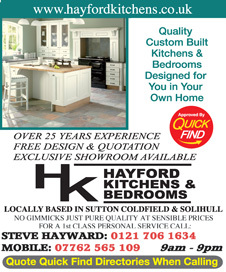 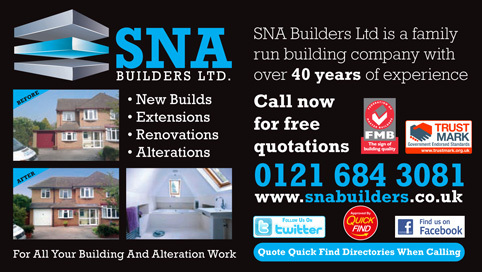 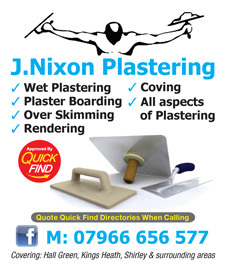 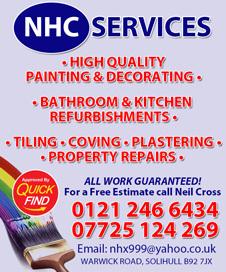 Approved and recommended by Quick Find Directories, NHC Painting and Decorating Services are a local trusted trader in Solihull, Shirley, Birmingham and surrounding areas.